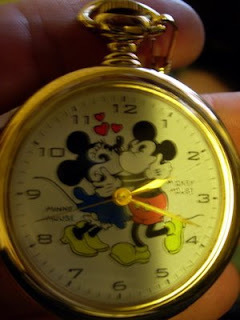 This beautiful pocket watch features Mickey Mouse and Minnie Mouse kissing. Notice the 3 hearts above them. Mickey is in his classic red shorts, and Minnie is wearing a blue dress. Notice that it's old-style Mickey and Minnie. This watch was the gift watch that you got if you bought all 6 watches from the Disney Store in Fossil's "Watch Collector's Club Series V". This cool watch came inside a beautiful music box (as did all 6 watches in this series). Believe me, this is one of the best watches that I've ever had. It's on a chain (as most pocket watches are), and it is numbered #1817 out of 7500. The cool thing about the Watch Collector's Club is that only the people who buy all 6 watches and redeem the coupons for them will get the 7th watch- so, although 7,500 of these watches were made, a lot fewer than that were every shipped out. Therefore, this is a very, very rare Mickey Mouse watch. I like it because it looks great, has an old-school style, yet is new and classy. I've used this watch only a couple of times- mostly I have kept it in storage with my other collectible watches. I just might start using it again! I have never seen anyone else with this watch. I would be willing to part with this extremely rare Mickey Mouse and Minnie Mouse watch for $5,000 plus shipping.